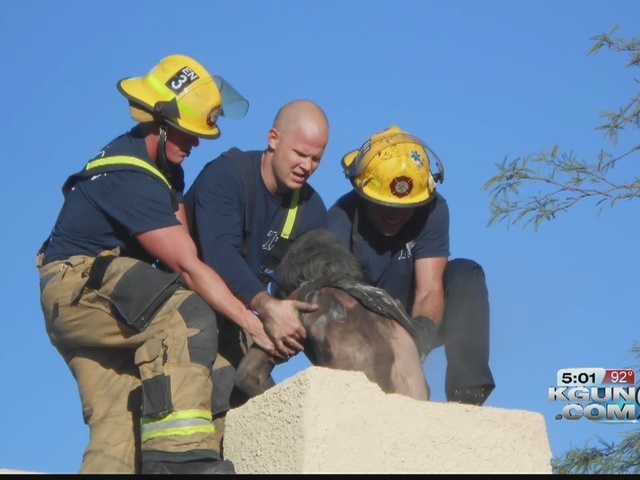 Crews from the Tucson Fire Department rescued a 26-year-old man from a chimney at his University-area home Sunday morning. TFD says the man was stuck in his chimney for four hours after he said he locked his keys in the house and was attempting to go back inside. A neighbor heard the man yelling for help and called Tucson Fire. Firefighters responded and lowered a rope to the man whose feet were touching the floor of his house, however, was wedged due to the decreased diameter near the fireplace. Crews were able to grab onto the man and carefully remove him. The man did not appear to be injured and was medically evaluated at the scene by paramedics. TFD says the first arriving crews from Station's Three and One were able to perform the rescue.